There are a lot of furniture creations today that are adapting the new modern architecture designs of the coming generations. With our mind's very creative imagination, there are so many inventions today that project a futuristic look of lifestyle. Take for example this very unique shower enclosure from Spacify. 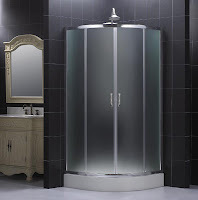 The glass enclosure is made from frosted class that has fixtures in chrome finish and anodized aluminum profiles. I want to have something like this in my bathroom. Also, I have seen a lot of great Modern Furniture designs that are Italian made which I am sure to be of high quality and reasonable price. Goodness! I am drooling to get these sets of furniture for my house.